Blogger is an free website for making blogs with slot of free themes and lifetime free webhosting. If you choose blogger for start blogging then you have to learn about some tips for making best blog from your knowledge. Blogger is an website with a lot of free widgets and options which will extremely helpful in writing blogs. All widgets and features in blogger website is very simple but you have to gave time to them for understand there work and effect on blog. On blogger dashboard you will see many options like layout, themes, earnings and these options also have some some options so this made blogger some confusing. 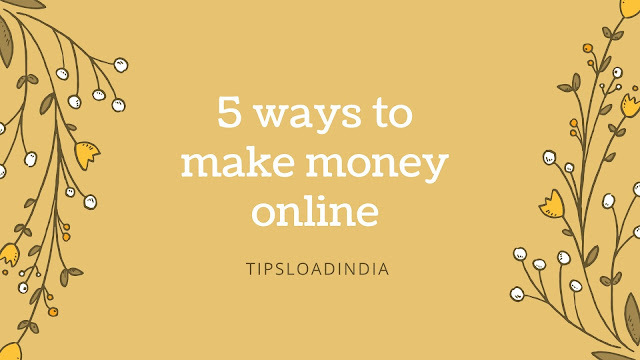 All these options help you to make your blog user friendly and look beautiful if you use all this option in right way then you can do all of Works from your blog look to your blog SEO. Today I will describe all options on blogger dashboard and show you effect of them on your blog appearance and theme design. Blogger have and huge users count and also have an big dashboard which help visitors to make best of them. There are many options on the blogger dashboard at the front of you while you are using blogger. Each of them have an important role in your blog appearance on web Search Engine Optimisation. , you must have some knowledge about how to use these options in right way. • post ::- you will see first option in blogger dashboard of posts, this option is for your all written posts and all drafts. You can see all your published and draft post also in this option. You can track all posts in this option, you can edit your published posts and view them. 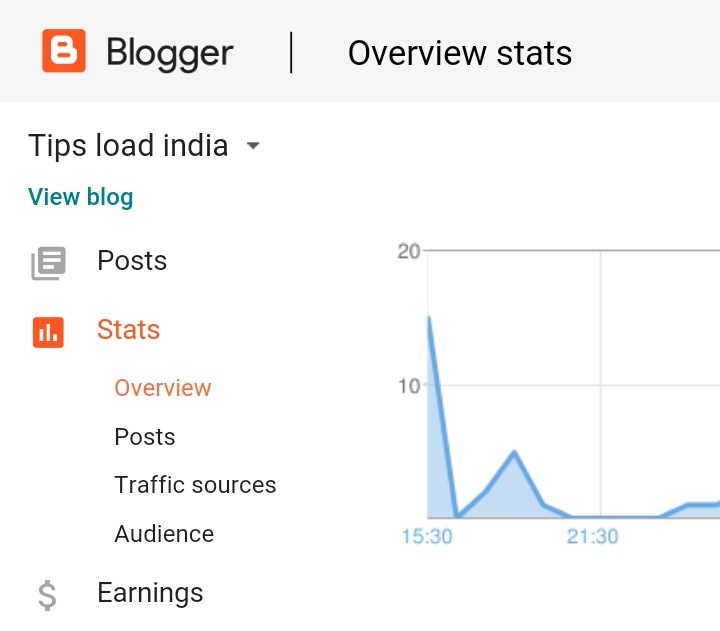 • stats ::- this is the most important option in blogger dashboard because in this option you can track your website data. You can easily see how many viewers see your blog in last days. You can analyse all your website data at one place, you can see all visitors on world map.You can find all traffic source from where you get all visitors on your blog. 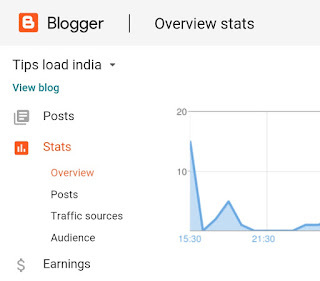 • earnings ::- in this section of blogger dashboard you can manage your all income information with Google AdSense you can easily switch your AdSense account from this option. 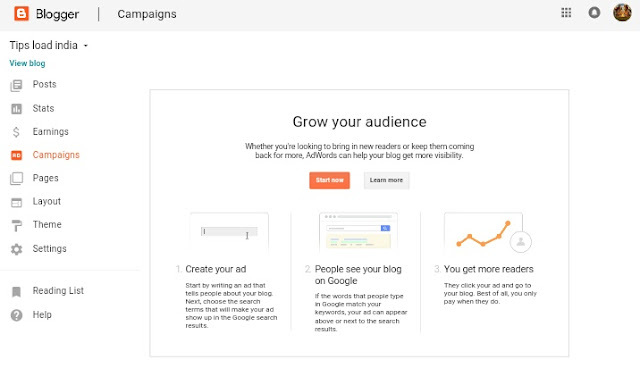 You can also see your linked account and earning in AdSense account. You can manage ads on your blog from here. • campaign ::- In this dashboard option you can make a campaign for your blog and publish it into search engines with help of Google AdWords. You can make a as of your blog to increase your visibilit, you have to pay for every campaign you publish. • layout ::- layout is most important thing of blogger dashboard because this can change your blog look. This is only feature from where you can add or remove things from your blog. You can set all content position from here and mange position of ads from here. In this option you can easily manage your post situation. You can add widgets from here to your blog. • Theme ::- this option is for theme in your blog you can change theme of your blog from here you can choose your blog theme from here and you can also customise theme colour and style from here. 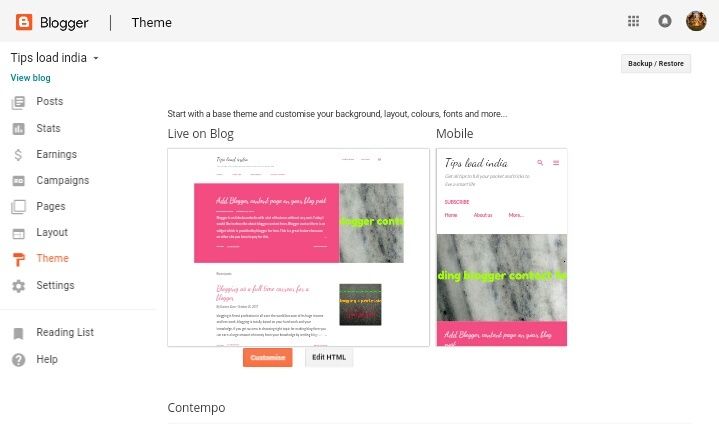 This is very important option of blog because in this option you can customise html theme of your blog. • settings ::- setting have some suboptions, in this option you can manage all slogen and images of your blog, you can change your domain name from here, you can make some seo changes from here, blog all information are available here. You can add Google analytics I'd here for contacting Google analytics with blogger.